how to size trekking poles? Home › Forums › Gear Forums › Gear (General) › how to size trekking poles? im thinking about getting a set of stix, and i was wondering how i should size them to fit me since they aren't adjustable. I usually set mine so that my elbow is at a little less than 90 degrees when my elbow is at my side. What trekking poles are not adjustable? Get adjustable ones. It can help to have different lengths when your ascending, descending or rigging an impromptu tarp tent. Your best choice if you have it is to either use a set of adjustable and figgure out how long or short you want them to be, or if you don't have a set of adjustable to borrow some from a friend and use them for a while untill you have a good idea, its hard to just give a generic size for trekking poles since it depends partly on how you use them not just how tall you are. i'll try to get a set to borrow. i appreciate the quick responses. I'm very tempted to purchase a set for myself. Especially at their current price. I already have a set, but it would be nice to have a spare. I just can't buy a fixed length set of poles. I don't use my poles 100% of the time while I hike. Where would I put them while not in use? How would I use them for a tarp setup? How would I travel with them on an airplane? Adjustable poles are just the way to go IMHO. If you plan on using them 100% of the time, and you have no possibility of airline travel… I'd say buy them. I see the poles you're talking about now. I thought you were using slang. They're tempting for the price, but could be a waste of money if they don't match your trekking style. I adjust mine too much to consider nonadjustable poles unless it had a longer hand grip. 90 degrees at the elbow is generally how I hold my trekking poles. Going Uphill for a stretch, maybe shorter. A quick and dirty estimator would be to hold a tape measure in your hand, which your elbow in front of you at 90 degrees as if you were holding the poles, and measure the distance. I have to get them adjustable. The length I need them for hiking is quite a bit shorter than what I need for a shelter. I personally can't see any reason for not getting poles that will adjust for various situations. YMMV, of course. But it appears to me that by getting fixed length poles, you are stuck with only one use. I have some BPL Stix, and I love them. In fact, I ordered a second pair for backup since they are at such a ridiculous price. I was pretty hesitant at the non-adjustable factor. 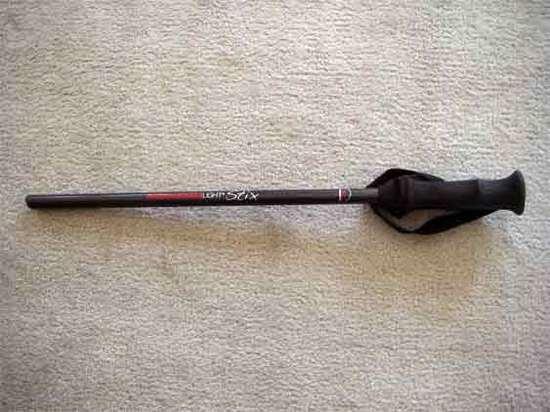 I had never owned trekking poles before. But I followed some online advice to measure from hand to ground with elbow bent at 90 degrees. Worked perfectly for me. The stix are really nice, extremely light, and durable. True that they can't really be used for much shelter setup, but if that's not a need you have, go for it. Due to a bad knee, they are my favorite piece of equipment I own. For 30 bucks I am tempted to get myself and my girlfriend (8" shorter than me) a set. If by "measurement" you are referring to the length of the poles as stated on the STIX page (110cm, 120cm, etc. ), it doesn't appear that the "measurement" is from the "bottom" of the handgrip to the ground. Instead, the advertised length is as "measured" from the top of the handgrip to the ground — so that the handgrip's length is part of the advertised "measured" length. From STIX web page: "Sizes (tip to tip)"
I only used them for a day . They felt stronger than the GG LiteTrek 4 however the GG felt better to me. Less vibration or something like that. At the same time since I do adjust them very often, the Stix are not for me , in fact even the GG are a bit of a pain to adjust. That is because I am used to the BD Flick Lock. Sorry to harp on this, but if you don't adjust the pole height according to the terrain, you are not using them efficiently. The strongest reason for me not to have them would be that they are a problem in transit. The bits I have are the result of the poles getting crashed inside the luggage compartment of a bus. But as an "extra" pair, I would definitely consider them as they are ,obviously, a lot lighter than my BD. BTW, I just realised yesterday that my "standard" pole height is about 1 cm less then my elbow. So much for the 90 degree rule. I used a pair of BDs, one of the first models with Flic-locs, for over 10 years. They weighed 10.7 oz each. When I decided I wanted to try the Stix I measured the length I set the BDs most of the time. I found my hand was about 4 inches higher than it would be with my elbow at 90 degrees. Two friends I often hike with are slightly taller than I am but their poles are several inches shorter than my Stix. I use my Stix both with my Tarptent Double Rainbow and with my hammock tarp. I have no problem getting the height I want. I really like the much lighter weight of the Stix. I drive where ever I'm going so the fixed length is not a problem for travel. If I were to fly I would take the old Black Diamonds.